It's hard to get any more classic than Airstream's Classic travel trailer. Redesigned yet as timeless as the day it was conceived. And since that day it has become a legend on the road; a true icon of American design, never compromising the elements — artistic or scientific — that made it justly famous. Whether your taste is traditional or high-end, whether your goals are relaxing in nature or high adventure, whether you're escaping or joining in, alone or with family, the Airstream Classic is for you. Nowhere else will you find a home-away-from-home with this perfect balance of luxury and efficiency, and this kind of living history. Can-Am debuts the 33' Classic in 2017. This brand new layout features a spacious rear bathroom that will be a huge hit for full-timers. And with three extra feet of living space, it's hard to resist. 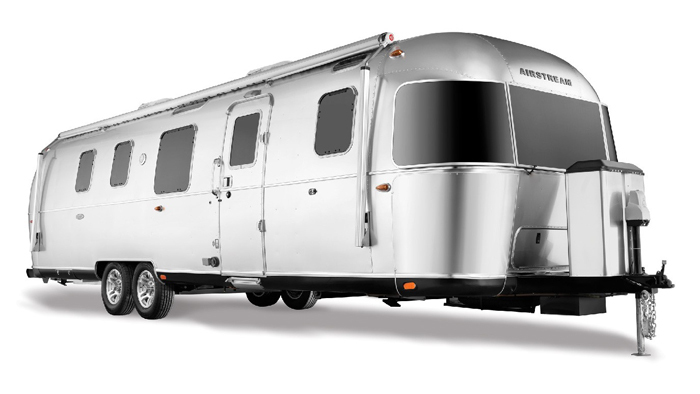 The twin-axle design maintains Airstream's ultimate towability. Note:The Classic 30 and 33 are both available in twin layout.